The Automatic Sticker Labelling Machine Model LABELSTIK-120C-Twin, is one of the most user friendly. The Machine incorporates latest sophisticated Micro Processor Control Label Dispensing system with user friendly Sensing system for Label and Product. The machine is suitable for applying TwoSide Security Labels in “L” Shape on Two side of Cartons with speed upto 120 Products per minute depending on cartons and label size. 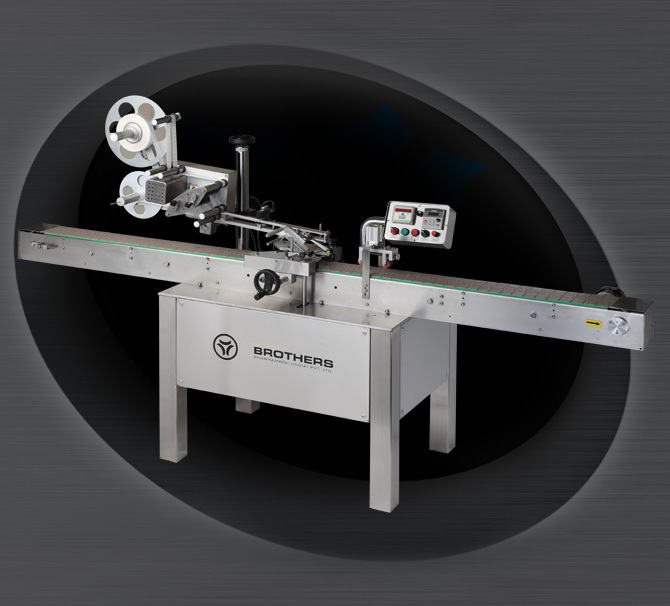 Machine can be used for Self Adhesive Paper Labels, Film Labels or Hologram. It is capable of Labelling up to 120 units per minute depending on Product Size, Shape, Product movement direction and Label size. Machine suitable for all type Cartons. Machine can be used for Off-Line or On Line application, however customer require to send us sample of cartons and also detail of carton position while movement as the position of carton is important and required to feed and desired position for two side label application. The Sticker Labelling Machine LABELSTIK-120C-Twin has its own unique single point synchronize speed control system. The Inbuilt Automated Label Length detection systems eliminates any need for manually feeding and storing of Label Length data in memory and retrieving the same every time for change of Label Size & re-starting the machine. The System thus saves valuable time, avoiding machine-down time, and helps achieve higher production. Machines having required all basic features as a standard fitment to match the current market needs and also saves cost and time. 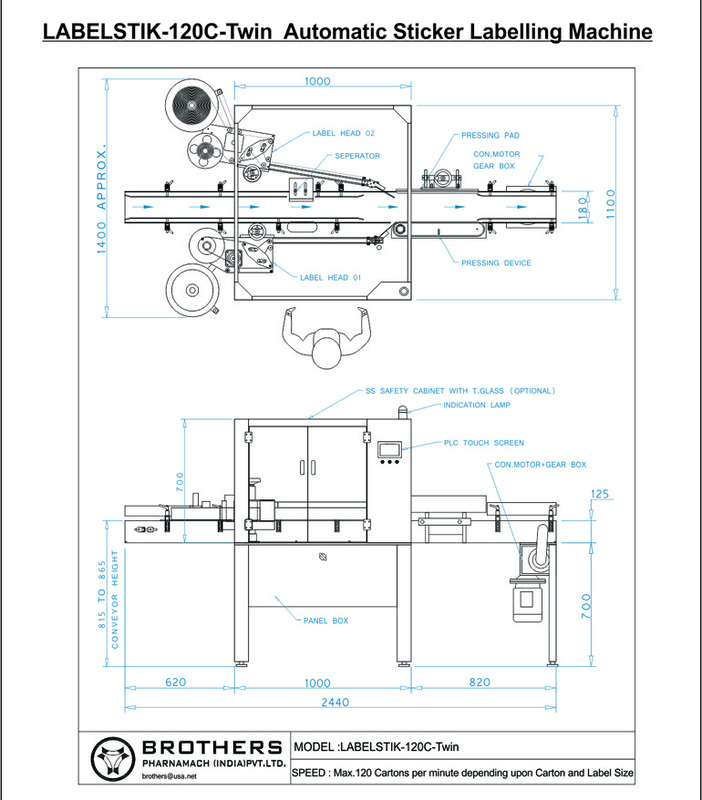 Machine also available with optional special features of applying Twin Label on products from Single Label Roll or application of Label on product at regular intervals. Built In A.C. Variable Frequency Drive System. Special Label Sensor for sensing Transparent Film Labels which does not have any sensing mark on it. Option of Contact Coder, Hot Foil Coder, HP Cartridge Coder and Inkjet Coder with various speed range available. For Film Labels, Sensing mark required on release paper or we can supply Special Film Label Sensor which does not require any sensing mark on label or release paper. Product Feeding : Cartons required to feed on machine with regular interval/gap between cartons in required position by customer or required to feed manually by operator on machine in required position. Copyright © 1999-2012, Brothers Pharmamach (india) Pvt. Ltd. All rights reserved.